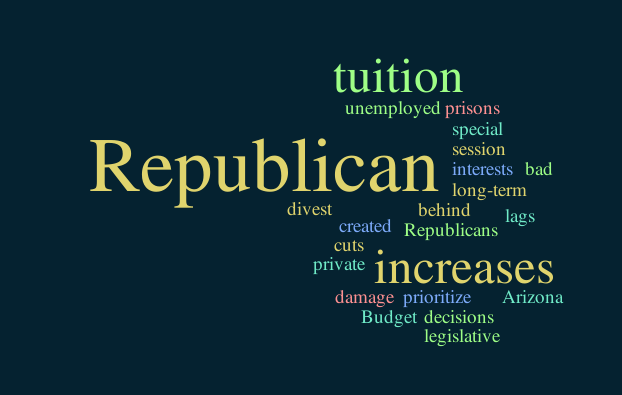 Throughout the legislative session, the Republicans showed that they prioritize special interests (like private, for-profit prisons) over ensuring a prosperous future for our state. Arizona lags behind the rest of the country’s economic recovery, and that is because the Republican leadership in this state refuses to invest in education or job creation. Just last week, all three Arizona universities proposed additional fees and tuition increases for some students to offset the nearly $100 million Republicans cut from their budgets. Breathe, Arizona. The Legislature has left the building! A budget is a statement of values, and so is a legislative agenda. The Republicans have shown that they do not value public schools, universities or the economic stability of our state. We can do better than this. House Democrats remain committed to finding innovative ways to improve neighborhood schools, make higher education more affordable and ensure that there are sustainable, high-wage jobs here. If you have ideas about how to move Arizona forward, now is the time to get involved. Click here to find ways to make your voice heard.